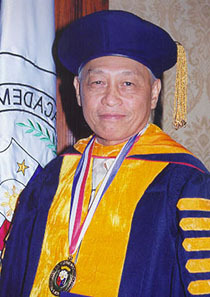 In recognition of his pioneering and significant contributions to Nematology including host-parasite relationships, national survey and identification of nematodes infesting economic crops, and their cultural and biological control which undoubtedly enriched the science of Nematology in the Philippines and earned him international recognition and the distinction of the first Filipino to be included in the "Who is Who" in Nematology. His discoveries on the cultural and biological control of nematodes have provided the Filipino farmers effective tools against nematodes, thereby increasing their crop productivity and income. He discovered the first biological control agent against nematodes, which has been commercialized in the country as well as in Australia and Germany. 1986 - Recipient or G.Y. Zara Applied Science Award for merilorious resaearch achievements in the field of biology and control of nematodes. Given by the Phil. Association for the Advancement of Science, Inc.
1991 - PANTAS Award given by PCARRD, With a Research Grant of P200,000. 1998 - Outstading Community Service 1998 Award as a leading implementor of the UP System's Pahinungod Program in a Farmer-Scientists Training Project for Sustainable Agricultural Development in Cebu. Given by the U. P. Alumni Association Cebu Chapter. 1999 - National Development Paper Award, First Place in connection with the Farmer-Scientists Training Program for sustainable Agricultural Development in Cebu for Com, Rice, Vegetables and Dairy Production. Given by PCARRD during its 27th Anniversary Celebrationat PCIRRD, Los Baños, Laguna.